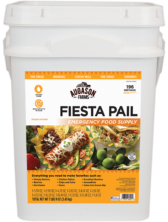 Augason Farms® Pinto Beans, better known as “frijoles,” are most often refried for use in tacos and other Mexican dishes. But they are also tremendously popular in a variety of bean dishes, such as barbecue, chill and baked beans. High in fiber, low in cholesterol, these delectable beans are ideal for everyday cooking, as well as long term emergency storage. 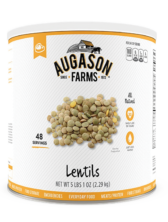 Augason Farms Lentils are the perfect addition to daily meals. 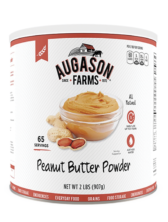 Low in calories and high in nutrition, they’re a good source of protein, help increase energy and support a healthy digestive system. Plus, their nutty and earthy flavor makes them a delicious part of any meal. 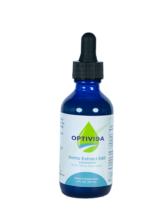 With so many benefits, having lentils as part of your emergency food storage is a must. 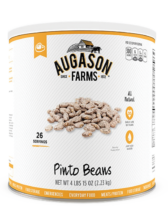 Augason Farms Pinto Beans are a flavorful, mild bean most commonly used in Mexican dishes, but also perfect for chili, barbecued and baked beans. 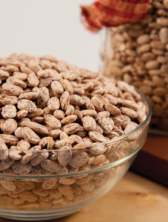 High in fiber and iron, low in cholesterol, these beans are ideal for everyday cooking, as well as long term storage. Few would argue that a food that is rich in protein, high in fiber and a powerhouse of nutrients shouldn’t be included in an emergency food supply, let alone as part of one’s everyday cooking. Pinto beans are just that. 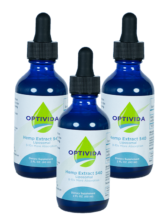 This superfood with mild flavor enhances almost any meal. 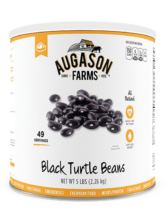 Augason Farms Black Turtle Beans have a dense, meaty texture perfect for a variety of dishes, from Mexican to Cajun and Creole. Served alone or with rice and meat, they’re great for soups and casseroles. 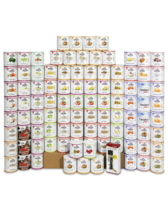 Like all beans, these store well both for long term emergency food storage, and everyday cooking.